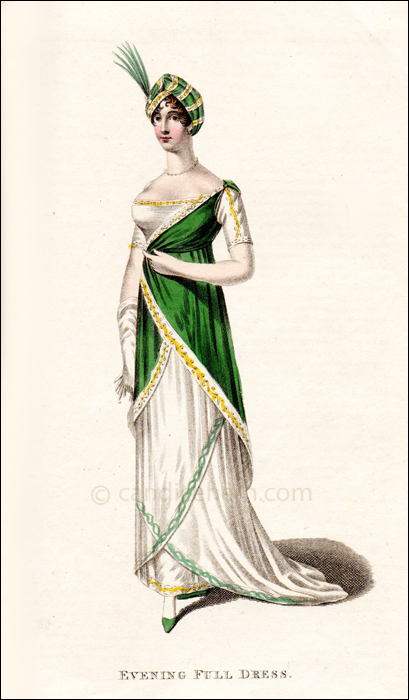 I love this very elegant dress, especially the green tunic. The turban gives the model a somewhat more mature look, but it still appears very stylish. This elegant dress exhibits the continued influence of classical Greece, which was so prevalent in the prior decade, especially in the draping. 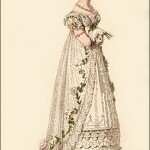 In fact, the dress appears to have been copied from, or at least inspired by, a French print from 1802, seen at right. 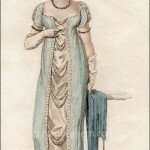 It is from the Parisian magazine Journal des Dames et des Modes, March 26, 1802. 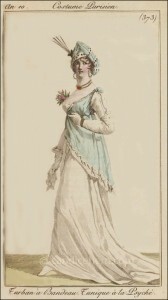 It is not unusual to see an earlier French print modified a bit for a later British magazine. 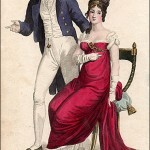 It seems French fashion continued to inspire, no matter how old the original design. Click on the print to see a larger version.